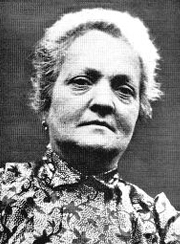 Eusapia Palladino was born in Murga, Naples , on 31 January 1854 . Her mother died a few days after her birth, and her peasant father gave her to be raised by a couple of friends. Before she was one year old it is said that she fell down and badly hurt her head. From that fracture on her skull, perplexed scientists observed, years later, a slight cold draught coming out while the medium was in a trance. Since Eusapia’s childhood, a white tuft of hair grew from the head scar. Her father was assassinated when she was eight, and a friend of his took her to her grandmother’s house. She was very badly treated by this grandmother, and was one day found abandoned in the street. A charitable family brought her home, only to expel her months later, because of her clumsy and unhelpful character. Another family who had been friends to her family took her on for a few days, while preparations were made to send her to a convent. At that time, visitors to the family suggested everybody tried the experiment of table tilting. All the adults present sat around a table and waited for it to move. After a quarter of an hour, as nothing had happened, they decided to invite Eusapia in to help with the chain. After a few moments, the table started to levitate, the curtains moved, the bottles and glasses started to clatter and the bells started to ring. After they established the phenomena were produced through the girl, the family decided to keep her on and not send her to the convent anymore. These phenomena happened throughout her childhood. According to the medium herself, there was an English lady who was married to a Mr Damiani, in Naples . During a Spiritist séance, this lady was asked by a Spirit who called himself John King, to go to a certain address and look for Eusapia, as he wanted to use her as his medium. Mrs Damiani did so, establishing the first contacts with Eusapia. The two women sat at a séance and John King manifested through the medium. From these events, Damiani and Professor Ercole Chiaia offered her mediumship training and as they wanted to have her available for their experiments, they offered to pay her, making her independent. Seeing an opportunity in this, Eusapia agreed in cooperate and, with time, mediumship became her only occupation. According to Professor Chiaia, Eusapia was a woman of extremely humble social standing, robust and illiterate. Her first introduction to the European scientific world was through a letter from Prof. Chiaia to Dr Cesare Lombroso, published in an Italian newspaper of 1888, where he describes his experiments and invites Lombroso to join him in the investigations. Lombroso only accepted the invitation in 1891, and after several experiments, he became convinced of the authenticity of the phenomena and declared: “I am confused and feel sorry I fought the possibility of the so-called Spiritist facts so persistently.” It was thanks to his conversion that many other important European scientists decided to start investigating psychic phenomena through Eusapia. The phenomena produced by Eusapia were listed and classified a number of times. According to Morselli, a professor at the University of Genoa , in his book, Psychology and Spiritism (1907), the first class of phenomena were called mechanic and occurred while the objects were in contact with the medium’s body. They were oscillations and other movements of the table, with or without any meaning; raps and levitation. The same would happen with the curtains of the cabinet and the medium’s clothes. The second class of phenomena were called telekinetic, which described movements without direct contact between the medium and the objects. Objects that were far from the medium were brought to the table, the chairs where the researchers were sitting would move, musical instruments would play. The third class comprehend the alterations to the gravity of objects: oscillations in the arms of scales, changes in the medium’s weight, varying from 5 to 10 kilograms, levitation of the medium’s body, production of cold draughts at the beginning of the manifestations, irradiations from Eusapia’s head and body. Sounds and signals constituted the fourth class. Raps, knocks and other noises occurred at the table or far from the medium, sounds of musical instruments, sounds of hands and feet, voices. Mysterious signs were also left on the attendees wrists, stains on the table, and pencil marks on the walls. There was also the occurrence of direct writing, either utilising pencils or pens (ectoplasmic hands) or without them (pneumatography). Also mouldings left in substances like plaster-of-Paris would be produced, such as hands, fists, feet and even faces in profile. A fifth class of phenomena was the unexpected appearance of objects brought from afar, either on the table or in the room (introduced in the room through closed doors), like flowers, branches, nails, coins and stones. The sixth class comprehended materializations, defined by Morselli as the creation ex-novo of shapes more or less organised, which had the physical properties of matter, i.e., of being resistant to touch (tangible). The phenomena observed included touching, prodding, kissing, biting, hand-shaking (one would feel the skin, the hand’s warmth and the movement of the fingers). A subclass could be described as the luminous phenomena, points of lights flashing, tongues of fire and the appearance of luminous clouds. There was also the appearance of dark “prolongations” in the form of human limbs that emerged from various parts of Eusapia’s body and which were given the name “pseudopods”. Professor Cesare Lombroso later added another class to Morselli’s system, including isolated phenomena: 1) influence on photographic film 2) mind reading, vision in darkness, at distance 3) understanding of foreign languages unknown to the medium, like English and German 4) influence over electroscopes, which were discharged at distance. During her life, Eusapia submitted herself to 36 research commissions, from 1888 to 1909. According to Morselli, she manifested forty-four types of mediumistic gifts. She disincarnated in 1918, at 64, after almost half a century of continuous investigations, under the most rigorous conditions stipulated by the greatest scientists of the time.